Meet Almaz, a local businesswoman and leader! She lives in Sodo, Wolayta, Ethiopia. Almaz‘s husband became gravely ill and their family lost their entire livelihood when he died. Like many families in Ethiopia, as a woman headed household she and her family suffered greatly from lack of work and no resources. Roots Ethiopia interviewed Almaz and learned she was well known in her neighborhood for making wonderful injera. 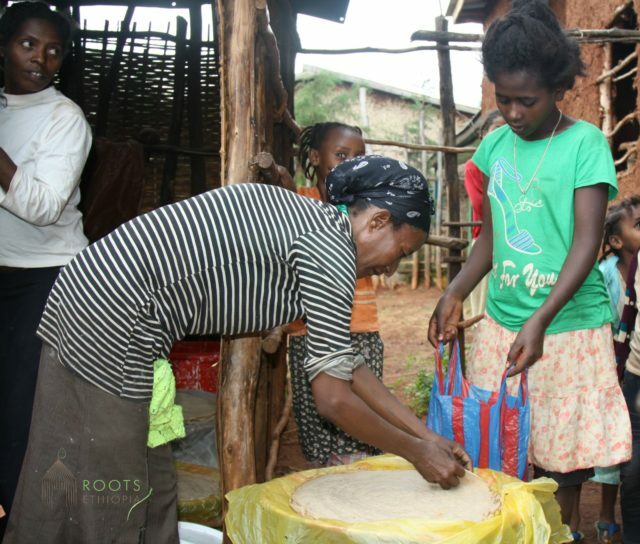 Her grant allowed her to start a small injera selling business right in her neighborhood, in front of her home. Almaz has created big change in her life! People come from all over the neighborhood to buy her fresh injera. She built a small outdoor kitchen outside of her home and she cooks and sells injera every day right off the mitad! Almaz and her 5 children feel confident that they can improve their lives with school, hard work, and savings and planning. Almaz‘s success is possible because YOU provided start-up resources she needed to unlock her potential and lead the way! This year’s campaign to fund 30 more women in business is underway. You can be part of our continued work to promote women and small business success. Please consider a gift today. Next Next post: Science Teachers – Innovation and Exploration!